I don't know why but honestly the trailer made me laugh. Probably because you're a rolling ball with a face and a loose tongue, something about that just made me smile because it's silly but it works. Crumble was originally made for the 42nd Ludum Dare Game Jam (their page is here), which was held back in August of last year. The theme for the Game Jam was "Running out of space" and I think they had a pretty great idea for it. 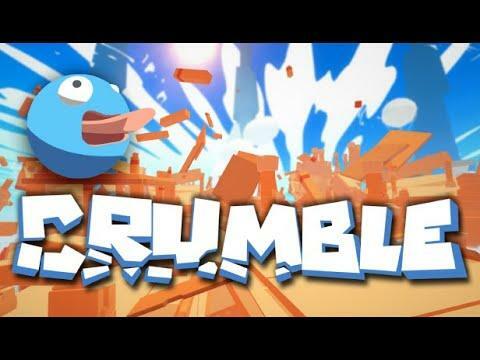 I spoke to the developer yesterday who did confirm that Crumble will have Linux support, although the Linux demo has been a bit delayed it should be up in "a week or 2". You can wishlist and follow it on Steam. The full release is going to be sometime this Summer, as always I will let you know when we get a more solid date. Looks great; though it's a bit of a missed opportunity that they didn't name this "Swingers of the Tongue", or "Tongue-Swingers", or somesuch.